Marine debris and particularly floating plastic is a major hazhard for wildlife. Seabirds, turtles and marine mammals may ingest plastic, which may cause their death. Discarded plastic erodes to microscopic particles, which can enter the human food chain. Some plastic softeners may mimic endocrine hormones which impact reproduction. 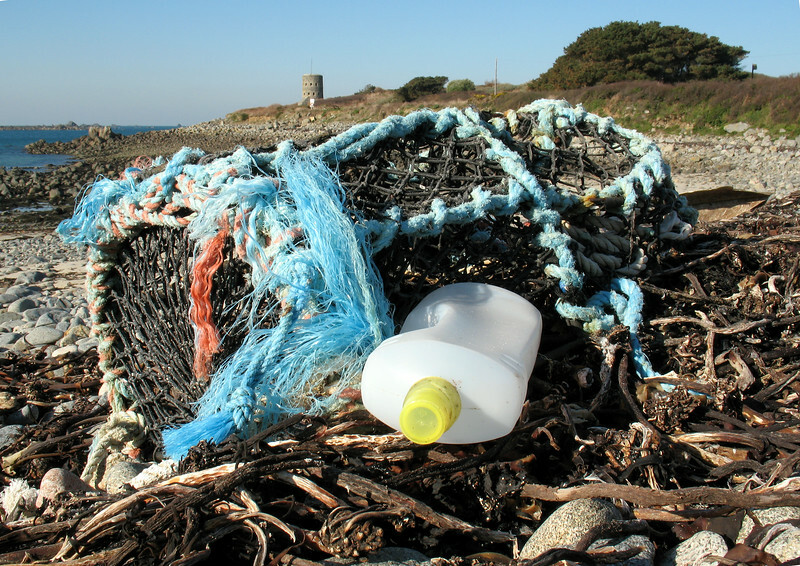 Marine debris washes up on the Guernsey shore regularly. Much of it is from ships including fishing boats. Storms bring up broken crab and lobster pots. Beach cleaners often find an odd shoe, cigarette lighters, Nylon fishing twine and line, pieces of polystyrene and insulation foam, plastic bags and plastic bottles, and thousands of pieces of hard plastic including disposable plastic cutlery, plastic bottle tops and plastic toys. Before we cleaned the strandline of washed up marine litter at Champ Rouget on Guernsey's north-west coast I walked the strandline and took photos of debris that stood out. I wanted to photograph the debris as it was left on the shore by the receding tide. Guernsey Climate Action Network (G-CAN) volunteers have decided to visit this beach on a regular basis to record and remove the marine debris that washes up. The information will be posted on the G-CAN website when time permits.